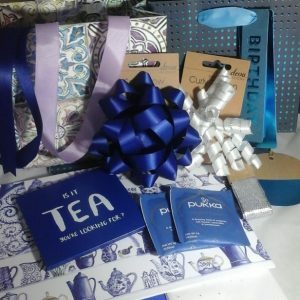 Deluxe subscription box with cards, gift wrap, ribbons, tissue and more. When you send a gift you want the recipient to say ‘wow, that looks amazing!’ before they have even started to unwrap it. Well now you can achieve that wow factor with the deluxe gift wrapping subscription box! The cards and gift wrap deluxe subscription box contains cards, notecards, gift wrap, tags, ribbons, tissues and more to give you a complete gifting stash for the month. Each month I choose a different theme and hand pick a selection of cards, gift wrap and some special extras for your box. Putting these boxes together is an exciting and rewarding creative process and I hope you love opening the box as much as I love putting it together. If you’d prefer just cards then take a look at the greeting cards box.